We're offering our clients the opportunity to spread the cost of their Semi permanent make-up, Microdermabrasion and laser lipo treatments over several affordable payments - interest free! There are no extra costs and no lengthy forms to fill out just the chance to have the great treatments you deserve a little sooner than you may have thought. Book by minutes of time in - keep an eye open or ask about extra free minute offers that we sometimes have! You could lose inches in your lunchtime! A non-invasive procedure, no surgery, no pain, no needles and with no recovery time at the amazing price of just £100 for 8 sessions Saving £150! A clinically proven skin resurfacing treatment that can give fantastic results for problem skin, pigmentation, lines and wrinkles and scarring. See the improvement in the texture and appearance of your skin, including reducing and smoothing lines and wrinkles! this is a £20.00 saving on booking single treatments! 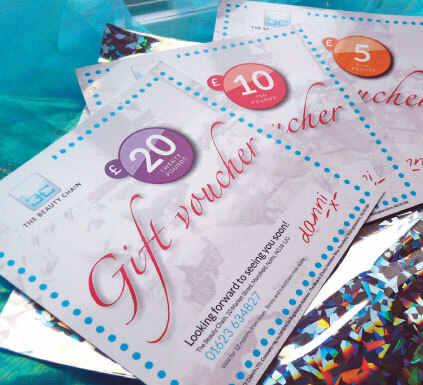 Ask about The Beauty Chain gift vouchers - suitable for all occasions, today!